After screen testing such actors as Sam Neill and Mel Gibson as the new Bond, producers eventually offered the role to Pierce Brosnan, who was forced to step aside when he got the Remington Steele TV show. Enter Welsh actor Timothy Dalton, a lethal, more cold-blooded Bond that stands in stark contrast to Moore’s tongue-in-cheek portrayal. A-ha provides another contemporary Bond theme and does the fine Duran Duran track “A View to a Kill” one better by being thoroughly and unabashedly poppy, and truly excellent as well. To me it’s a total standout, another indicator that Bond themes work best when they’re more uptempo. If you hate this song then you need to open your earholes and stop hating fun. Dare I say, this is my favourite Bond theme. Dalton’s Bond is introduced in a thrilling pre-credits sequence that finds 007 on a training mission, parachuting onto a remote island. Someone didn’t get the memo and is using real bullets, forcing Bond to take decisive action. Immediately it’s clear that action is more of a priority than the last few entries, as Dalton shoots to kill as a much more calculating and deadly Bond. He still makes time for the ladies, even if his romantic overtures aren’t as convincing. The main plot concerns a byzantine series of Soviet defections and double-crossings, and while it’s somewhat confusing it nevertheless serves as worthy glue between the well executed set pieces. It’s also a curious snapshot of a moment in time, as Russia was engaged in combat with the Mujahideen (Afghan guerilla warriors) and Bond sides with them in order to oppose his eternal Soviet enemies. The Living Daylights has a trio of villains who are memorable in different ways. Dutch actor Jeroen Krabbé plays Soviet General Georgi Koskov, initially a defector to MI6 who is later revealed to be a double agent. Krabbé has fun with the wormy character, making him truly hateable. He eventually teams with the American arms dealer Whitaker (Joe Don Baker), a Napoleon-obsessed military nut who embodies the worst American stereotypes (loud, crass and gun crazy) and is more enjoyable for it. The henchman Necros rounds out the triumvirate. 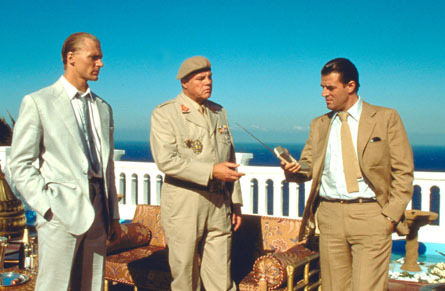 Tall, blond and German, the actor Andreas Wisniewski would later make a career out of playing henchman with appearances in Die Hard and Mission: Impossible. His weird henchman trait is strangling victims with his Walkman cord (which constantly blares “Where Has Everybody Gone” by Chrissie Hynde – I guess he only has one tape). The Living Daylights cycles through the usual Bond action tropes – aerial stunts, car crashes, ski chases and a bombastic ending – but here they feel fresh and renewed with the brutal energy that Dalton brings. He actually did many of his own stunts, and everything feels elevated and more dangerous than the last few tepid Moore films. Whether it’s a rooftop footchase in Tangiers or a brutal fistfight in an Afghan prison, the stakes seems raised and Bond is fully dialled in. Dalton’s Bond is a fighter not a lover. While he looks the part and can wear the hell out of a suit, his 007 doesn’t have the thuggish charm of Connery or the erudite refinement of Moore. More than anything he’s exasperated by the women he meets, sleeping with them almost as an obligation. There’s a new Moneypenny (played by Caroline Bliss), and Bond’s banter with her is perfunctory at best. James manages to meet a bikini-clad women in that fantastic opening, then spends much of the rest of the film with Kara Milovy (Maryam d’Abo). D’Abo’s expressive and typically gorgeous, but is too often a thorn in Bond’s side. Her cello proves to be her defining characteristic, as it becomes a crucial plot point, with her and Bond even riding it down a mountainside at one point to escape some thugs. Ultimately Dalton’s Bond seems somewhat predatory, and while his relationship with Kara is by turns innocent and weirdly paternal, he feels more at home when he pulls a questionable stunt like stripping a woman of her top as a distraction. It’s not quite the retrograde sexual politics of previous entries, but it’s hardly a step up. Dalton’s 007 proves to be a sleek, heartless killing machine that makes for a considerably darker Bond, but one that is thoroughly enjoyable here. I’m not sure his run would’ve been sustainable, but it hardly matters now as at least we got this film out of it. The Living Daylights may have its detractors but I’m not one of them. Unique while still paying homage to the past, it’s a successful Bond and one of my favourites.